@IBOutlet weak var categoryCollectionView: UICollectionView! image = UIImage(data: Data(base64Encoded: String(imageStringer), options: .ignoreUnknownCharacters)!)! for loop文でRealmからデータを取得している変数 morningArray を回しており、次のfor文で morningArrayから取得したデータ morningArrayValue に imageStringのデータを与え回しています。変数 imageStringer に base64 を使用しUIImage型に変換しようと考えています. 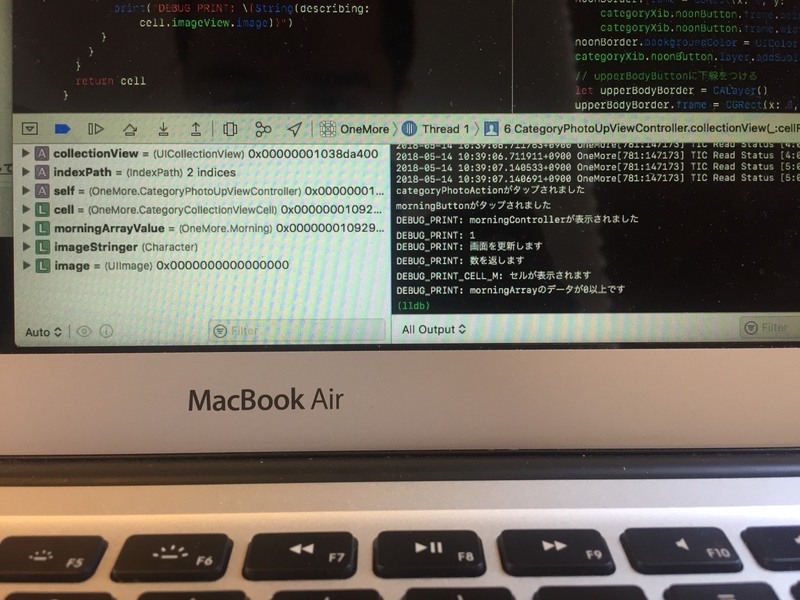 @objc dynamic var postID = ""
@objc dynamic var userName = ""
@objc dynamic var imageString = ""
@objc dynamic var caption = ""
@objc dynamic var time = ""
image = UIImage(data: Data(base64Encoded: morningArrayValue.imageString, options: .ignoreUnknownCharacters)!)! @objc dynamic var imageString: String = ""
追加のコードは質問内に追記して下さい。 で、クラス定義で型を明示するとどうなるでしょうか？ @objc dynamic var imageString: String = ""